With our new partnership with ibi Marketing, we are now able to offer the top notch SEO, SMM and Paid Search Marketing that you need to succeed. In celebration of our growing team, we're offering a special on SEO services. If you are a local business and want your organic rankings to increase, contact us to schedule a consultation. We are proud to provide marketing management and quality consulting for every job, large or small. Our team members have experience managing fortune 500 and small/startup companies. We accomplish our clients' goals by using assertive proprietary tactics, 20+ years of marketing experience, and maintaining high ethical standards. Search Engine Placement (SEO) Get your website to show up on top of the major search engines for the right keywords. Our search engine placement services are affordable yet extremely effective in building your search engine optimization. Paid Search Marketing Increase sales and generate more leads through Pay Per Click marketing. Our search engine placement services include competitor analysis, key phrase development, conversion tracking, and more. Social Media Marketing Significantly increase targeted traffic to your website through our social media marketing services. Each campaign is tested and proven to yield highly targeted traffic and may also boost your search engine placement. Want to compete with the sites in the top 10 but not sure how to get top search engine placement? Need to generate more leads and improve conversions with Google certified Pay Per Click optimization? Looking to build viral campaigns and generate real brand awareness with our social media and link baiting campaigns? Did you know 80% of internet sales come from search engine placement and paid search listings? Contact Us today and let's discuss the possibilities! Hollywood Woodwork is a local construction company that has spent years transforming inspired designs into extraordinary projects. 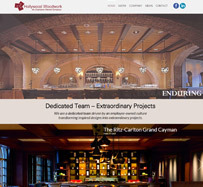 Check out their website, www.hollywoodwoodwork.com, to view the new brand concept GD Design Studio and Hollywood Woodwork worked together in creating from 2014-2015.